As of Sunday 01 February 2009, Phineas Messmer and Zoe Connolly switch command roles, with Phineas Messmer as Marshal of the RCAF and Zoe Connolly as Air Chief Marshal. Phin will take care of day-to-day operations and provide a stronger vision for 2009 while I work on other projects and manage Connolly Aerodrome. A much better division of our labours. 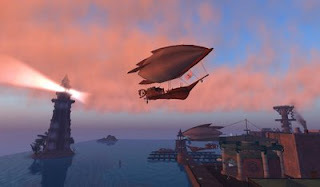 The Heliograph: The new Mayor of New Babbage: Mayor Tenk! "Director Bill Mason's short film focuses on his friend and fellow filmmaker, Blake James. In his never-ending quest for freedom, Blake pilots his own plane. 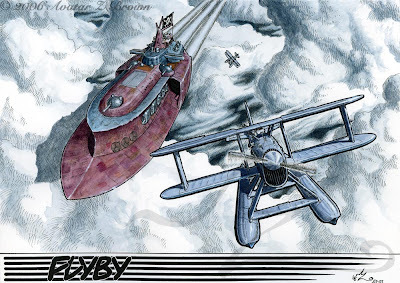 This film is Mason's view of his friend as a 'hobo of the skies,' but it is also an adventure that beckons the viewer to come along for the ride...."
Video Captured within the Combat Flight Simulator Game IL-2 Sturmovik 1946. "How to use the Norden Bombsight in the flight simulator IL2...."
".....With all the attention on the inauguration, the Tuskegee Airmen are getting some new attention. DeepGlamour.net put together a great slide show of the airmen when they were young and glamorous, taken by famous fashion photographer Toni Frissell. Check out the tight formation of Mustangs and lots more...."
"....One of the favorite entires, statistically speaking, tend to be those with large amounts of graphics, and especially those with airships and Steampunk technology. 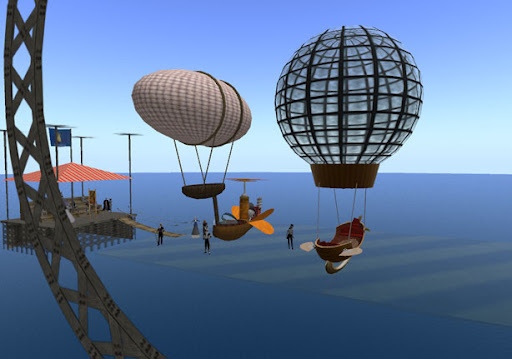 Be it for inspiration or admiration, returning to the purest form the genre (and turning away from other unsavory political issues in the SL Steampunk world), I am displaying some of the more recent entries in Deviant art, a hotbed for new and emerging artists. I have listed the title of their work and their "nom de plume" below each picture, so if you desire to see more of any individual's work, simply turn to Deviant art, and search on the artist in question, at: http://www.deviantart.com/...."
"....A new addition has been added to the Connolly Aerodrome in Caledon Penzance. Hovering above the airfield is a new blimp very similar to the one that has been there since my coming to Caledon. The difference? 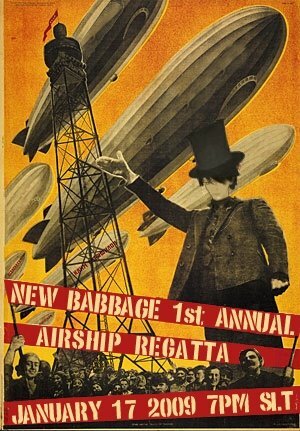 This new airship owned by Virrginia Tombola now provides air service from Connolly Aerodrome to Lionsgate Tower and back...."
"....Roscoe Brown will march with pride in the Inauguration Day Parade in Washington. 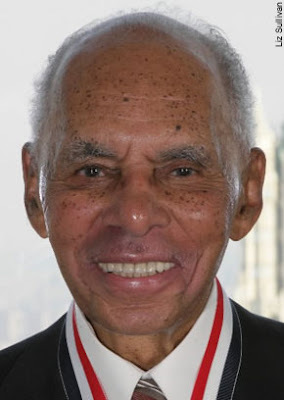 For 86 years this New Yorker has fought battle after battle against what he calls “the stupidity of racism.” This will be the ultimate day in a lifetime of helping to break down barriers. Brown and about 330 of his fellow pilots and ground crew members who still live have been invited to attend the inauguration of the first black president, Barack Obama. 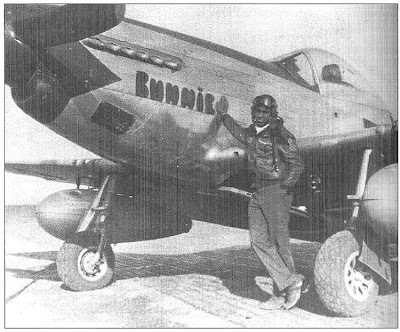 Brown, a professor and former president of Hostos College, will be wearing the black cap of the Tuskegee Airmen, the African-American men who fought for America in World War II...."
"**Starts at 2:00**US Airways flight 1549 crashes in Hudson River NY. The flight plan was from LaGuardia to Charlotte. All passengers survived. The plane was an Airbus A320. Both engines reportedly sucked-in multiple birds and both engines caught on fire. The pilot made a successful water landing. There were approximately 150 passengers and one infant. The pilots name was Chesley Sullenberger. He has been flying since 1980 for US Airways. He also served in the US Air Force." 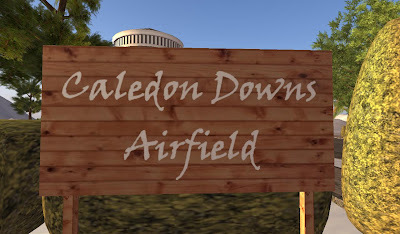 Caledon Downs Airfield sits on the Northeastern edge of Caledon Downs and can be located by a revolving green and white beacon set on a hill just to the north of the runway. 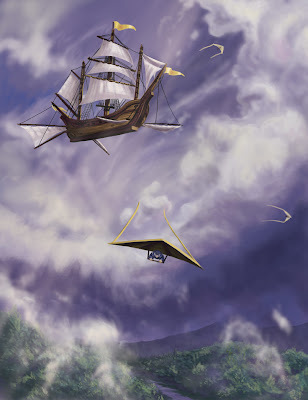 The Southern end of the landing strip is located at Caledon Downs 145,131,44, with a North/South layout...."
TimeForce 10 - "The Alien Device"
TimeForce 10 Agents Aether Inglewood, Avery Robbiani, and Zoe Connolly explore the mysterious Isla du Montserrat. The Secret Adventures of the Amazing TimeForce 10 from the Celestial Intervention Agency (CIA). CIA HQ: Extropia with offices in 1967 London and 19th Century Caledon. Front Group: Celestial Bodies Modeling Agency. Our mission: Keeping Earth safe from Super-Villains, Rogue Agents, Malevolent Extraterrestrials, Temporal Anomalies, and Bureaucratic Red-Tape. Music from United Future Organization, 3rd Perspective, The Planet Plan. "The world's most exclusive airplane, a combination of a luxury hotel and a super-secret military command post, is profiled in this documentary produced by National Geographic. The history of presidential flight, from its beginnings with President Roosevelt making a secret wartime flight in 1943, is covered, and particular attention is appropriately given to the historic flight that returned President Kennedy's body to Washington after his assassination. Filmed in the closing months of the Clinton administration, the film features the preparation for a presidential trip, which includes close involvement of the military and antiterrorist specialists of the U.S. Secret Service. The makers of this highly informative film were given unprecedented access to Air Force One, and the footage of the presidential 747 is spectacular." In 1944, the Nazi top brass believed that a rudimentary nuclear weapon might soon be within their scientists' grasp. Hitler, desperate to turn the tide of the war, hatched a secret plan for an aircraft that would usher in the age of global terrorism , the 'Amerika Bomber'. This would deliver the hoped-for 'wonder weapon' directly on to the biggest target of them all: New York City. Hitler's Plan to Atom Bomb New York uncovers the astonishing competition that was held between Germany's top aviation designers to build a completely new aircraft capable of carrying and dropping the bomb on the towers of Manhattan. They included a giant V-rocket that would later provide the basis for the Apollo missions, and a high-altitude craft with fundamental similarities to the modern space shuttle. The winner of the competition , a huge V-winged jet plane capable of crossing the Atlantic and returning in a single flight , was rushed into production. The film tells the story of how close the 'Amerika Bomber' came into being before an Allied mission put an end to the project once and for all. From its pre-war inception, the USAAC (later USAAF) touted the aircraft as a strategic weapon; it was a potent, high-flying, long-ranging bomber capable of unleashing great destruction yet able to defend itself. With the ability to return home despite extensive battle damage, its durability, especially in belly-landings and ditchings, quickly took on mythic proportions. Stories and photos of B-17s surviving battle damage widely circulated, increasing its iconic status. Despite an inferior range and bombload compared to the more numerous B-24 Liberator, a survey of Eighth Air Force crews showed a much higher rate of satisfaction in the B-17. With a service ceiling greater than any of its Allied contemporaries, the B-17 established itself as a superb weapons system, dropping more bombs than any other U.S. aircraft in World War II. Of the 1.5 million tonnes of bombs dropped on Germany by U.S. aircraft, 500,000 were dropped from B-17s. 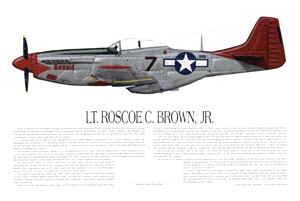 The aircraft went on to serve in every World War II combat zone, and by the time production ended in May 1945, 12,731 aircraft had been built by Boeing, Douglas and Vega (a subsidiary of Lockheed). North cay Public Airfield sits at the Southeastern edge of the Firth, the Caledon Cafall lighthouse just to the Northwest of the runway. 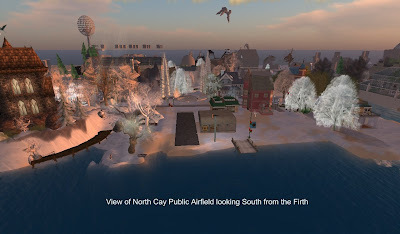 The runway its self laying in a North/South orientation with the Northern end located at Caledon Cay 119,242,22...."
New post on the TimeForce 10 blog. 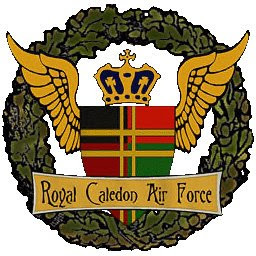 "....Set in the heart of Port Caledon this airfield until very recently was unknown to me or at least at it's current location. Port Caledon Field is owned and operated by ambiant Kukulcan. Port Caledon Field is very easy to locate sitting just beneath two large towers. 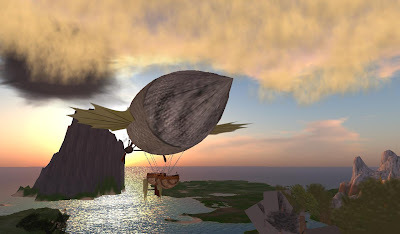 One emitting a powerful large beam of light into the heavens that with the right settings can be seen from a great distance...."
Many if asked will tell you the glory days of flying in Second Life have gone the way of the Dodo. 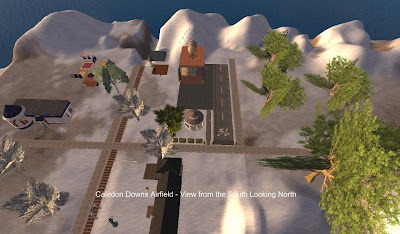 While to a certain degree this might be true, flight in one form or another is still thriving in Caledon as evidenced by the many airfields spread through out our fair land. 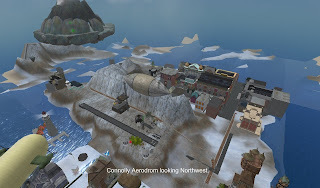 My intention with the following primer is to highlight some of my favorite landing spots and perhaps aid you in keeping the shinny side of your flying machines pointed toward the heavens.